Mi Woollies Wool Duvets (Wool Comforters, Wool Doonas), Underlays and Pillows are made with the highest quality wool fleece. Wool insulates and breathes, regulating your body temperature so you can be cosy in the winter and cool in the summer. Wool Duvets (Wool Comforters), Underlays and Pillows, manufacturered by Mi Woollies and are available directly to you at factory direct prices. 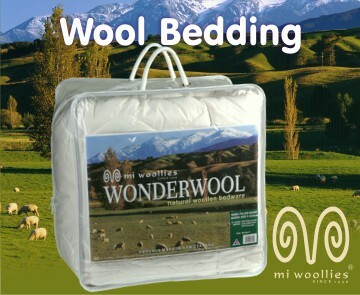 Mi Woollioes wool duvets are made in our Christchurch, New Zealand factory. Why is Wool such a good bedding material? 100% Natural and Healthy: Wool is 100% natural, non-allergenic and is a renewable resource. Superior Insulation and Resilience: Wool’s crimped fibre allows it to trap air and effectively insulate the body. Wool’s natural crimp and bulk also gives it excellent elastic recovery properties, making it a highly resilient bedding material. Comfort: Wool has the ability to take moisture away from the body and release it into the atmosphere, keeping the sleeper warm and comfortable throughout the night. The ability of wool to transfer the moisture we release in our sleep is important to maintain a comfortable sleeping temperature, and avoid waking up hot and clammy. Wool can absorb up to a third of its own weight in moisture without feeling damp. Most synthetic fibres can only absorb 1-2% of water without feeling wet. Better Sleep: Research has found that sleeping in wool can improve the quality of your sleep. Studies have shown that people who sleep in wool have a more restful sleep due to the consistency of their body temperature. In addition their heart rates are lower and more even and regular than those of people who sleep under manmade fibres. This all adds up to a better night’s sleep and a healthier life. Safe: Wool has natural flame resistant properties. It is difficult to ignite and slow to burn, making it a safe bedding material, especially for children. Unlike synthetic fibre, wool doesn’t melt into a hot wet substance that sticks to skin potentially causing severe burns. When wool burns it forms a dry ash that is non-sticking and cool to the touch.